Sahara Force India confirmed that Nico Hulkenberg will return to Sahara Force India in 2014 after agreeing a multi-year deal. relationship will ensure a smooth transition as the team moves into the new era of Formula One. Sahara Force India's full 2014 driver line-up will be announced in due course. "I'm delighted to see Nico back with Sahara Force India. When he drove for us in 2012, it became clear Nico was an exceptional talent and he has continued to impress everyone in the paddock with his strong performances this season. Having Nico in our line-up is a real statement of intent and a huge boost for everyone associated with the team. We have high hopes and expectations for 2014 and by signing Nico we have put ourselves in the best position to achieve those objectives and enjoy what could be our most competitive season yet," said Dr. Vijay Mallya, Team Principal and Managing Director. 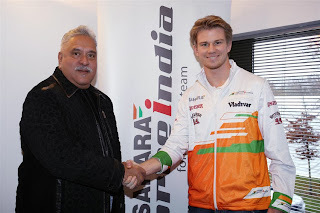 "I am happy to come back to Sahara Force India. The team is aiming high for next year and I believe that the experience I have gained over the years will help us achieve those goals. I genuinely believe we can have a competitive package in 2014. I've heard a lot of positive things about the Mercedes engine as well, so I think there is a lot to be excited about for next year. I know this team and I can see their determination; it's a great bunch of people and we all share the same hunger for success," said Nico Hulkenberg.